The Collection of John F. Fort, acquired in 1995. 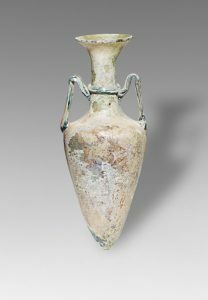 This refined amphoriskos, or little amphora, in semi-transparent blown glass displays an elongated conical body with pointed base and twin handles joining the long neck to its shoulders. Due to weathering, the fire-polished surface has attained an attractive, silvery iridescence. The glass-blowing technique was perfected by Roman glassworkers around 50 BC across the Mediterranean regions, with shapes taken from Attic pottery being adapted to glass. 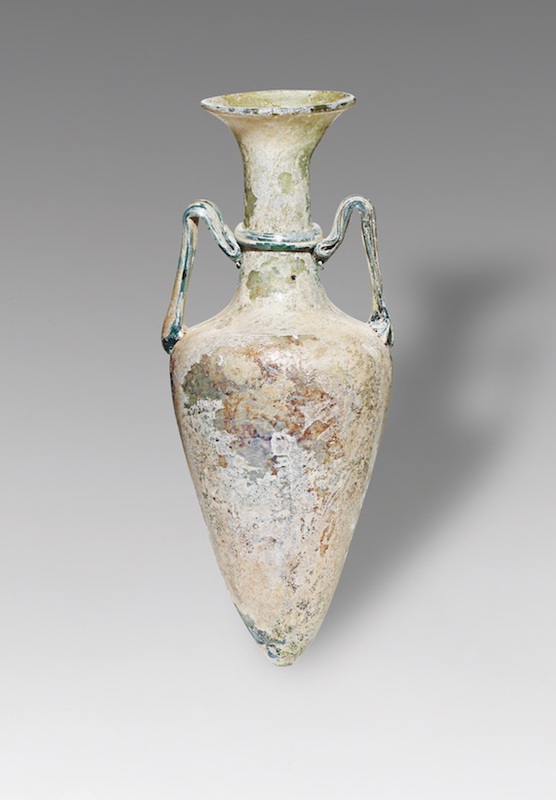 Roman glass vessels such as the present one would have held scented oils, and were especially popular in Syria and the Eastern Mediterranean provinces of the Empire. A similar amphoriskos, also dating from the 4thCentury AD, of similar proportions and with later-applied handles, is the Louvre Museum, Paris (inv. no. MNE 155, fig. 1). A second example, with coloured handles but of otherwise identical shape, also displaying the characteristic encircling thread around the neck, is the J. Paul Getty Museum, Los Angeles (fig. 2).